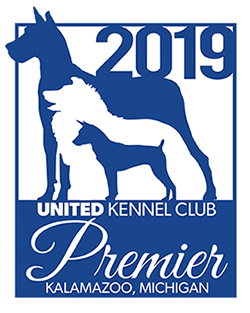 The oldest German rough coated pointing dog, protected by its breed club since 1892 and not interbred with any of the English pointing breeds. The German Rough Haired Pointer was recognized by the United Kennel Club in 2006. 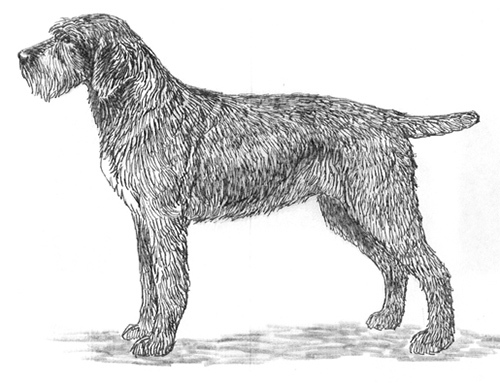 A strong pointing dog of medium to large size, with a stiff, hard coat, moderate beard and pronounced eyebrows that give the dog a grim appearance. Calm, courageous but self controlled, neither shy nor aggressive. The skull is broad and slightly rounded. Seen from the side, the highest point of the arch is in the center of the skull. The occiput is not too pronounced. Long and powerful, not pointed. The nasal bridge is straight. The lips are dropping and close fitting, the corners forming a fold. The German Rough Haired Pointer has a complete set of evenly spaced, white teeth meeting in a scissors bite. Light to dark brown, not flesh colored. Medium size, and slightly oval, with tight fitting rims. Brown in color, though they may be lighter in lighter colored dogs, but not yellow. Medium length, with blunt, rounded tips. Set on high and hanging smoothly and closely to the head. Medium length, clean and slightly arched, gradually widening towards the shoulders. The shoulders are sloping and strongly muscled; creating an angle with the upper arm that sets the legs well back under the body. The distance from the elbow to the ground is slightly greater than the distance from the withers to the elbow. The legs are straight and strong, with straight pasterns. The body should be square, or very slightly longer than tall. The chest is deep and well developed, and the ribs are well sprung, never flat. The withers are marked, and the back is straight and strong, with the topline sloping only slightly. The loin is well muscled and the croup is slightly sloping. There is moderate tuck up. There is good angulation between the pelvis and upper thigh. Seen from the rear, the legs are straight and parallel, with strong bone and muscles. The upper thigh is broad, and the lower thigh is long, sinewy and muscular. There is good angulation at the stifle and the hock. The rear pasterns are perpendicular. Round, with well knit toes and tough pads. Medium length, set on not too low, and strong at the root. Moderate docking is permitted. A natural tail should reach to the hock, and be carried straight or with some upward curve. On the body, the coat is stiff, harsh and bristly, approximately 1½ inches long. On the shoulders and the underside of the body, it is slightly longer, with some straight feathering. Sometimes there is a barely visible undercoat on the entire body. On the muzzle there is a moderate beard. The hair on the skull is close, short and harsh. The eyebrows are bushy and stand off, forming an arch. The head should be free of any soft, wooly or silky coat. On the front of the front legs the hair is short, hard and flat. On the back of the legs there is somewhat longer feathering. The back sides of the hind legs are slightly feathered. The tail is densely covered but there is no brush or plume. Disqualification: Soft coat, except for beard and eyebrows. Brown, with or without a white chest patch; brown roan, with or without patches; light roan, with or without patches. Disqualifications: Black color. Yellow or red markings on the head or legs. Height at the withers for males is 23.5 inches to 27.5 inches. For females, it is 23 to 27 inches. Upstanding and ground covering, with plenty of reach and drive. Parallel coming and going. Soft coat, except for beard and eyebrows. Yellow or red markings on the head or legs.